Singer Katherine Jenkins won the album of the year award at the Classical Brit Awards in central London. Her album Second Nature took the prize at the Royal Albert Hall ceremony. Fellow Welsh performer Bryn Terfel won the prize for male artist of the year, while US conductor Marin Alsop won the female award. Belfast-born flautist Sir James Galway was given a prize for his outstanding contribution to music, 30 years after his solo career began. Jenkins, 24, had two nominations in the album of the year category - Second Nature and her debut, Premiere. She rose to fame in 2004 after signing a £1m deal with Universal Classics. She performs before Welsh rugby home games and recently appeared at the VE Day commemoration concert in London, singing We'll Meet Again, the song made famous by Dame Vera Lynn. 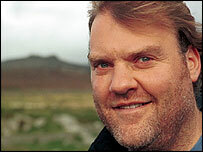 Bryn Terfel had three nominations, two of them for the baritone's album Silent Noon, with Malcolm Martineau. In March he was due to star in a live TV broadcast of Wagner's The Valkyrie, but the show had to be postponed after he fell ill.
John Williams took the soundtrack composer award for his work on both Harry Potter and the Prisoner of Azkaban and The Terminal, while John Adams won the contemporary music award for his album On The Transmigration of Soul & Road Movies. Natalie Clein won the young British classical composer award, while Harry Christopher and The Sixteen took the ensemble/orchestral album of the year prize. The critics' award went to pianist Stephen Hough, the Dallas Symphony Orchestra and conductor Andrew Litton for their Rachmaninov piano concertos.